This boutique hotel in Puerto Rico is in an ideal location, 500m from the sandy Amadores beach and resort boulevard. The property offers chic, modern rooms with a marble finish and all the relevant amenities to ensure a comfortable stay for all guests – better still, there are spectacular views of the sea. Facilities at Villa Manga includes a private sun terrace with a heated swimming pool and sun loungers, plus you can head over to the Maracaibo Aparthotel opposite for access to their Restaurante La Trucha and Spa Club. In the surrounding area, guests can explore the gorgeous beaches of the resort, or head to the nearby Anfi Tauro Golf Course (5km). Guests will find car rental services available at the reception for when they wish to explore the resort, as well as the airport shuttle service. Villa Magna is located in the Canarian town of Puerto Rico; a tourist area 1km from the beach of Amadores and 5km from the golf course. The famous beach of Maspalomas with its rolling ​​natural dunes is 12km away in neighbouring Gran Canaria. 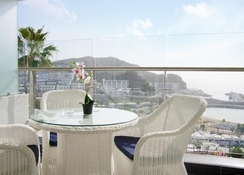 There is a shopping center 14km away and the Gran Canaria airport is 50km away. 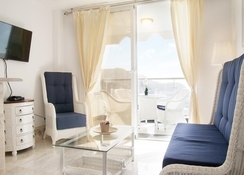 Villa Magna has elegant one bedroom apartments suitable for two people. 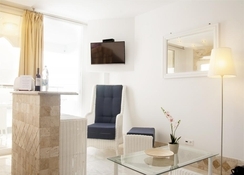 They are each beautifully decorated with marble and white, wooden furnishings, and are equipped with relevant amenities including a kitchen with utensils, a private bathroom, a lounge area with a sofa and a television and two singles or one king size bed. Each of the rooms come with an outdoor terrace. There is no restaurant at the hotel, so guests usually cook meals in the apartments fully-equipped kitchens. Additionally, if guests wish to eat out without venturing too far, they are welcome at the Restaurant La Trucha, across the road at the Maracaibo Aparthotel. Here you can enjoy a host of international dishes and Spanish delicacies along with drinks. 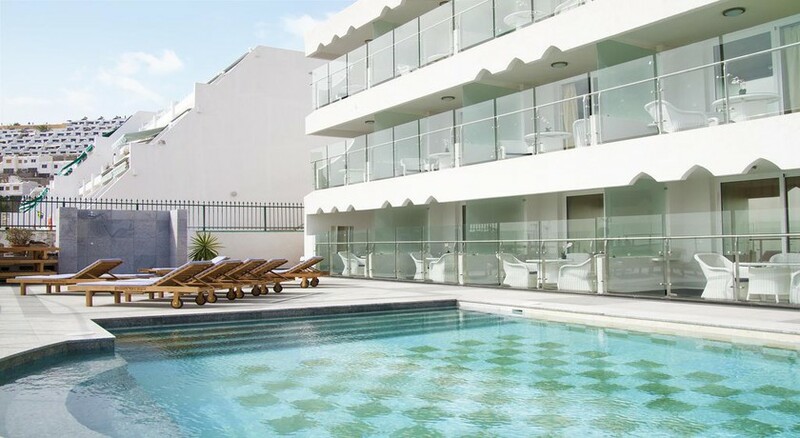 In the common areas of the hotel there is a private terrace with an outdoor swimming pool and solarium. At the Villa Magna reception, guests can take advantage of the car rental service if they wish to explore the resort at their own pace, and request airport transfers. Guests can indulge in the spa and a host of massage services at the Marco Polo Spa Club at Macaribo Aparthotel, opposite the hotel. This is also where the nearest restaurant can be found.